I’ve been developing a plan to incorporate more data analysis with my Pre-Algebra students. They’re in grades 6 and 7. As you know, when something’s on your mind, you start noticing it all around you. Which might explain how I came across two fun graphs in my RSS reader today. I’ve noticed a shift recently. More people are using graphs to show ‘data’. (Imagine I said the previous sentence and used air quotes at the end.) Why? The data are entirely subjective but represented in a graph form. 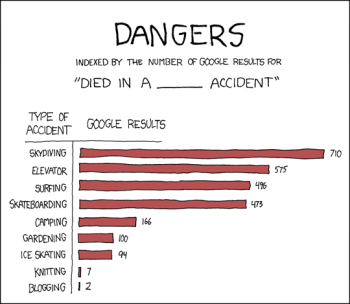 Indexed does a fun job with subjective graphs. Graphs like this help visual thinkers understand a statement. “As this variable increases, this other one decreases” isn’t as powerful as a curvy line on a x-y plot. The data are objective but quirky. Want to know what color book is most popular on Amazon on Tuesdays? I wouldn’t be surprised to find a graph…Data warehouses and fast computers mean we can slice and dice our data to find interesting patterns. Two other influences have me excited about graphing interesting stuff with students: Google’s Zeitgeist and the information design work on dy/dan, Dan Meyer’s blog. My Pre-Algebra students will start this week by analyzing graphs I give them. We’ll first look at pie and stacked bar charts. The goal is to develop an ability to infer from what they see in these charts. I hope you keep watching and talking about this! I know you are approaching this from a pre-algebra perspective, but I think Databases are SO powerful and SO ignored for the most part in our educational system. WAY back when we were using the Apple IIe there were these cool disks using Appleworks Database that already had all of the information about the presidents or other subjects on a disk. All you had to do was to put the disk in and you could manipulate the data to find things out…. but in my experience no one used them much. Oregon Trail was so much cooler and straight forward. I couldn’t agree with you more about databases! It seems to me that learning to look at a dataset and make an interesting graph is an introductory skill for database engineers, especially those working with data warehousing. For now, my 6th and 7th graders will work on paper. I’ll move them to Excel later in the semester. My goal with these kids isn’t creating horribly accurate, detailed graphs. Its looking at numbers and seeing relationships (like “as one variable increases, so does the other”). Thanks for bringing up the database connection! It’s got me thinking about bigger implications for graphing. I love your web sight Mommy!